ACT-SO is a yearlong youth achievement enrichment program designed to recruit, stimulate, improve and encourage high academic and cultural achievement among high school students. There are 27 categories of competition in the sciences, humanities, performing arts, visual arts and business. Students work with ACT-SO mentors who help them develop projects throughout the year. Local ACT-SO programs also provide ACT-SO students withe enrichment opportunities, such as workshops, tutorials, and field trips. The benefits of ACT-SO students receive from the enrichment and mentorship component include substantial assistance toward the development of their ACT-SO projects and valuable tools to assist them throughout their education. Each ACT-SO program conducts a local competition. The local competition serves to showcase the hard work students have put in all yearlong. Students receive medals and prizes provided by the local and regional sponsors and contributors. ACT-SO students who receive gold medals on the local level then compete at the National Competition where they receive scholarships and other rewards provided by national sponsors. *September through March: Local programs conduct mentoring and local enrichment programs in preparation for the local competition. *February/March/April: Programs host their local ACT-SO competition. *March through July: Students continue their mentorship and enrichment programs to prepare for the National ACT-SO Competition. High school students of African and Hispanic descent, who are residents of the United States, enrolled in grades 9-12 and are amateurs in the categories of competition are able to participate. 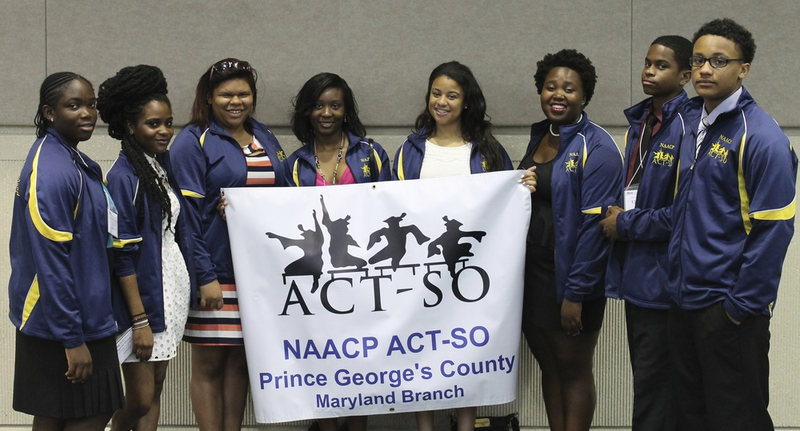 ACT-SO is sponsored by the National Association for the Advancement of Colored People (NAACP), which is the nation’s oldest and largest civil rights organization. ACT-SI receives support from schools, community organizations, churches, foundations, private corporations and individuals. This program is free for all participating students. TO COMPETE IN THE 2014 LOCAL COMPETITION CLICK HERE TO DOWNLOAD THE APPLICATION. MAIL IN THE COMPLETED APPLICATION TO 9201 BASIL COURT, SUITE 115, LARGO, MD 20774.